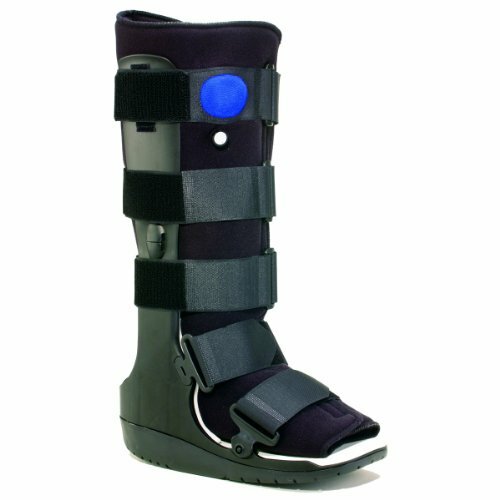 OTC brand (model 1793) inflatable air pneumatic high top walker boot. The OTC 1793 Inflatable Air Pneumatic High Top Walker Boot has a patented pneumatic system that increases stability while decreasing pain and swelling. The air bladder is easily adjusted to achieve desired compression and custom fit. Accommodates the swelling patterns that occur throughout the rehabilitation process. Features our standard walker frame design with a wide base for greater stability. Indications: Soft tissue injuries, grade 2 and 3 sprains, stable fractures, post-operative use, trauma and rehab. Air bladder is easily adjusted to achieve desired compression and custom fit. Accommodates the swelling patterns that occur throughout the rehabilitation process. Features standard walker frame design with a wide base for greater stability. Measure by shoe size. Available Sizes: Small (Men's 4.5-7 / Women's 5-6), Medium (Men's 7.5-10.5 / Women's 8.5-11.5), Large (Men's 10.5-12.5 / Women's 11.5-13.5), and X-Large (Men's 12.5+ / Women's 13.5+).